Is there a forum app to download to my iPad? I have one for a gun forum I am on. It is very handy. Hovercarl, this depends on the kind of forum that Skatelog is built from. If this is a phpBB coded forum, which I believe it is, tapatalk and TouchBB Lite for iOS should work. I haven't tried them, though. +1 for Tapatalk. I have it integrated with my forums and have had no trouble with it. It is free to us fourm owners, but the app is $3 I believe. Well worth it for the ease of use, and the fact that it is supported by more and more forums all the time. This explains why I couldn't find it on Tapatalk. Site Admins please fix this?? That's a bummer. But I understand the reason. While I can understand why people might want an app I have no issues whatsoever reading and posting here on my HTC (Android ICS) - can only assume the same is true on an I-device with Safari or whatever browser you choose to install (I've used Opera on both IOS and Android). I can't recall how to do it (got rid of my Iphone over a year ago now) but you can create an "app-like" shortcut to any website on the IOS homescreen. I did the same thing, but don't ask me how I did it, I can barely turn my phone on and off. You can get the app link on iOS through Safari's bookmark options. I don't use Safari, so it won't work for me. I prefer to have an easier to read/edit app than on the web, since the forum isn't web optimized. Maybe we will get lucky and someone will develop an app specific for SLF. Or the cacophony will be so loud that sysAdmin will add support for another app. If the admins won't install Tapatalk for security reasons, there are other options. 1. Upgrade to vBulletin Mobile Suite. This offers similar functionality to Tapatalk, but stays within the vBulletin framework. The downside is that it costs money (i'm willing to donate ). 2. A vBulletin theme might be installed that handles mobile browsers better than the current one. Likely this is free, but there may be cost involved here as well, but it will be significantly less than upgrading vBulletin itself. At any rate, the first option is the best way to go as it does not require any non-vBulletin code to be installed. Perhaps this is something to consider the next time the Admins decide to upgrade vBulletin. I disagree, on another site, with 2.5million participants, if you want to access the site with a phone(an un-blockable tapatalkad keeps popping up, sorta makes it impossible) it won't let you unless you have a paid version of tapatalk, I don't wish to be forced into buying nefarious apps. That's strange, I've accessed tapatalk sites on my regular phone browser, and I haven't had that experience. Maybe that's a setting the forum admin didn't turn off? Here is another vote for tapatalk support. It's a nice app that supports most forum software. There must be a way to disable the pop-ups so you don't advertise the app for free. That Tapatalk notice pops up on my tapatalk-enabled sites, but it simply tells you about Tapatalk and invites you to try it (buy it). It's $2.99. Hardly a hardship. If you don't want it, you just tap the appropriate button and continue to the site. As the site owner, I have the option of turning that off. If there is an ad that blocks the full site, that is something that the site owner implemented; not standard Tapatalk issue. The browser works fine on my phone too. Not really the point of the comic. 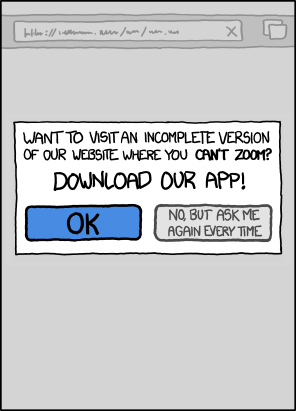 The point of the comic is sites that try to push their app incessantly. I just checked two of the worst offenders in memory on my phone (imdb.com, thisamericanlife.org) and they don't push their app when I browse them. I think the readability through Tapatalk is much better than with the browser, since you don't have to constantly zoom in and out.